Last Thursday with my son in tow, I made another trip down to Pt. 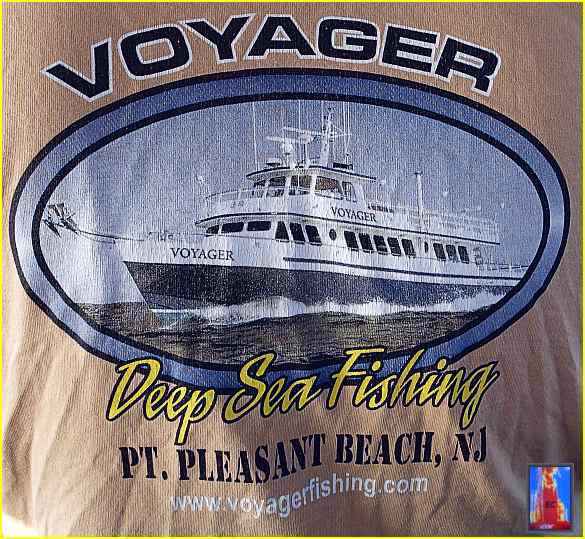 Pleasant Beach, New Jersey to fish with Captain Jeff on the >> VOYAGER << for his weekly Ling Marathon. 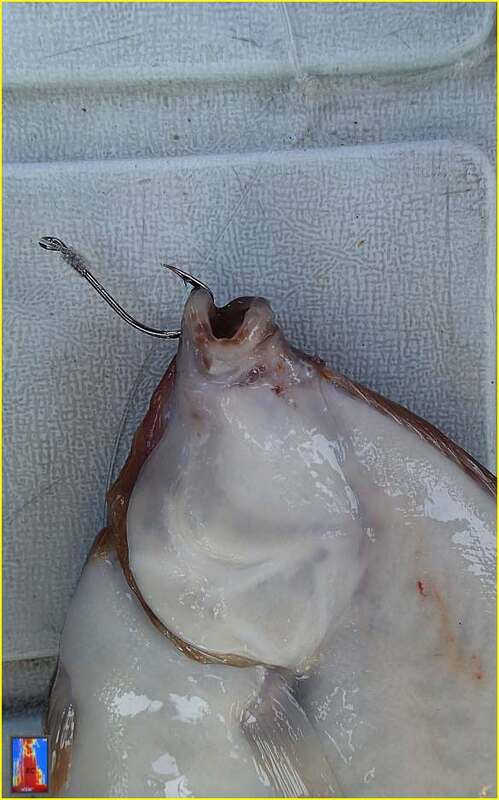 This time though, I would be targeting blackback or what some term "ocean run sea flounder" using just a single hook rig...and from what I saw in using this particular rig, it should be something for fishermen to keep in mind when specifically looking to catch large flounders around sticky wreckage in this area. 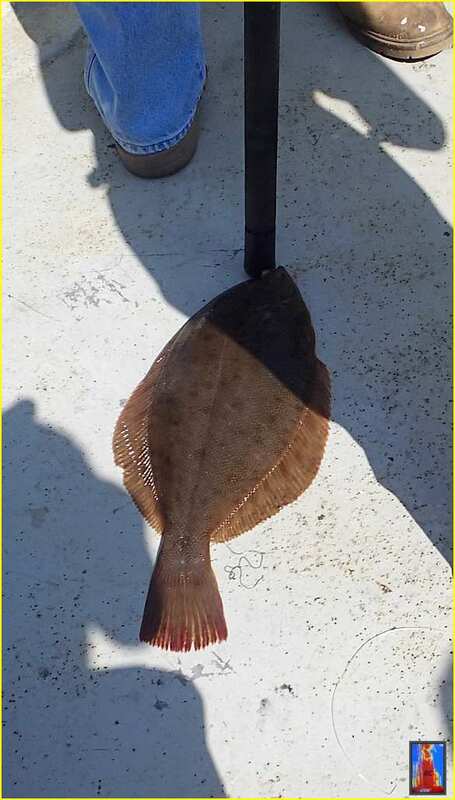 Once again I will pass along some tips, opinions and observations along the way as we 'fine tune' how to catch winter flounder in the NY-NJ Bight. 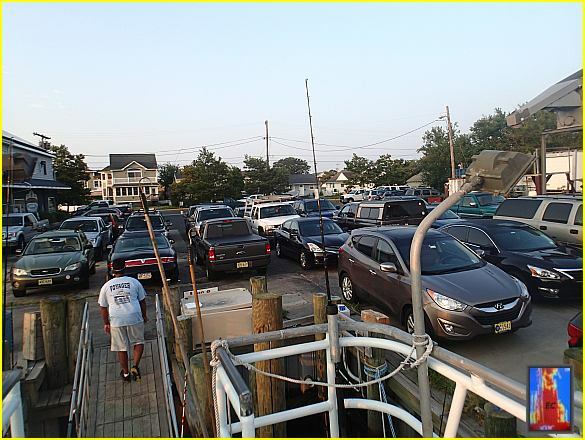 Here is the scene in the Fishermen's Supply parking lot around 6 am in the morning. As you can see in this image, these LING MARATHONS which are done just once a week (Thursday) during the summer, are extremely popular. But, don't fret about having to get their early just to get a favored spot along the rail of the VOYAGER. 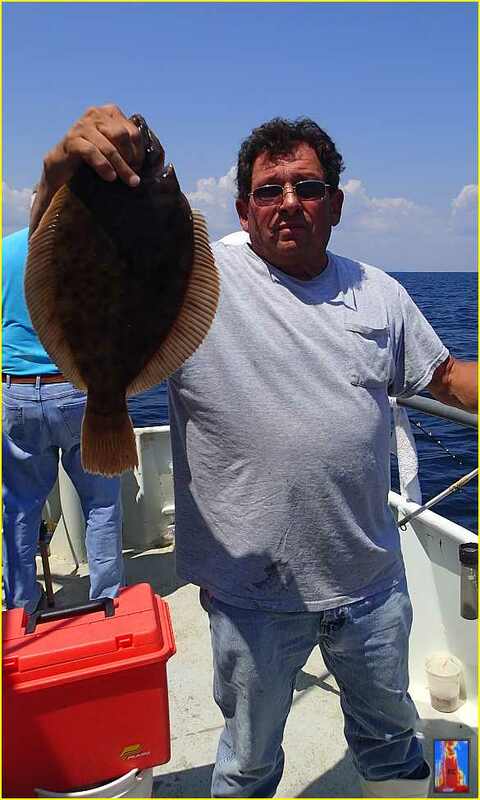 There are more times then one would think where the better or more consistent fish catching for these sea flounder, is along the sides or even up in the bow (which was the place to be on the prior day offshore cod wreck trip). 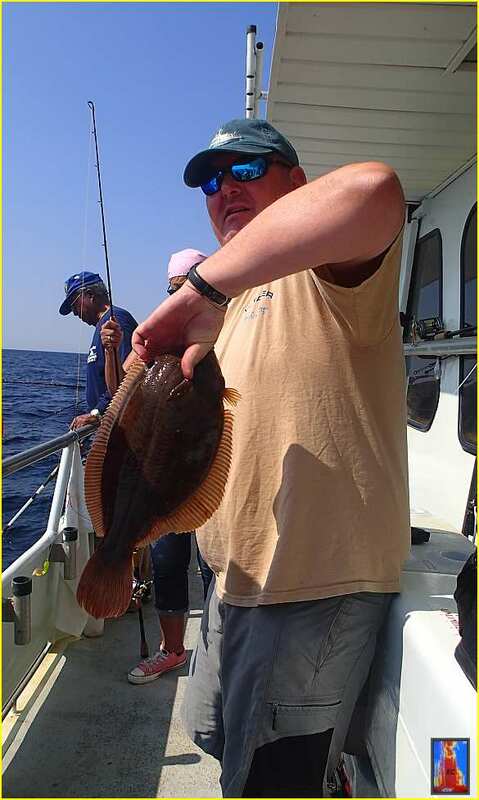 I should also add that the LING & SEA BASS trips done each and every week will also give you a good opportunity to catch these sea flounder along with the bonus of a few biscuits (possession limit of 3 at this time of the season) in the catch too. (more on the rig to use on these trips latter). Nothing like fishing during the summer and going out in the early morning. Can one say "blue-bird" conditions, with calm seas...so far at least? Just keep in mind that latter in the day, their is always a high probability of the prevailing south west winds coming on, so keep a light weight rain slicker-type top in your tackle bag, just in case you tend to get cold. 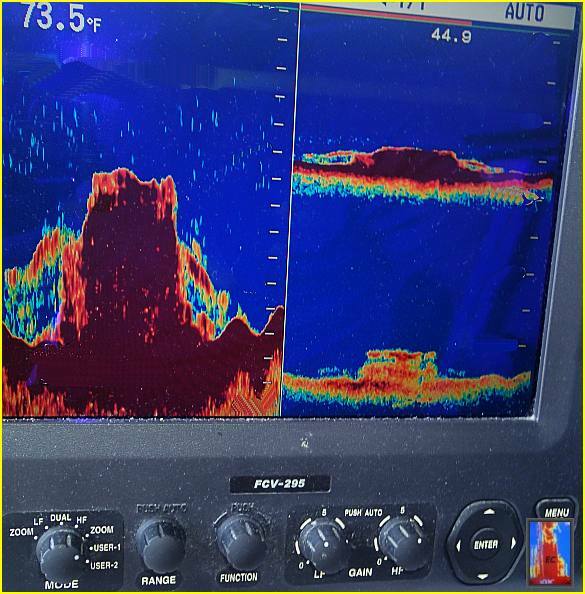 With a good number of fishermen on board the VOYAGER for this trip, a longer steam was made to another area of deepwater wrecks. 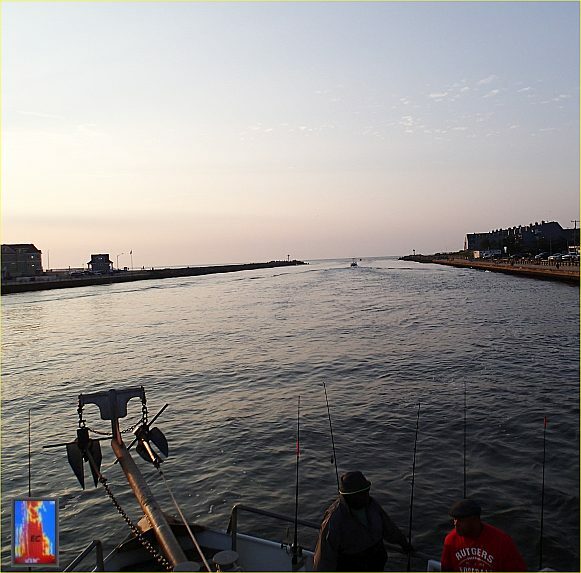 I should point out here, that even those fishermen who do have some understanding and familiarity with some of the wrecks in this area, should not fret on what direction the VOYAGER or for that matter, any party boat leaving Manasquan Inlet takes as they go past the inlet. 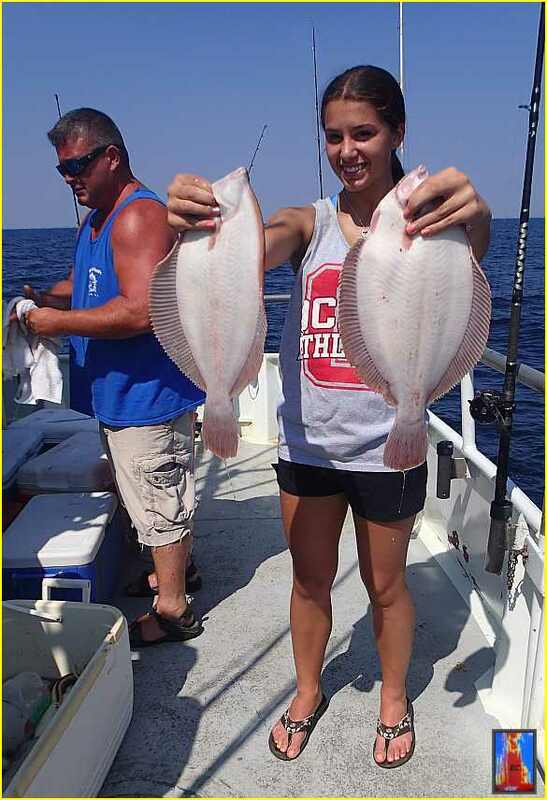 Whether it is to the north, east or south, very productive ling, sea flounder or sea bass fishing will normally be had at this time of the year. There is no such thing here as "he should of went in this direction"....that I can assure you all here. Now onto wreck number one for the day. 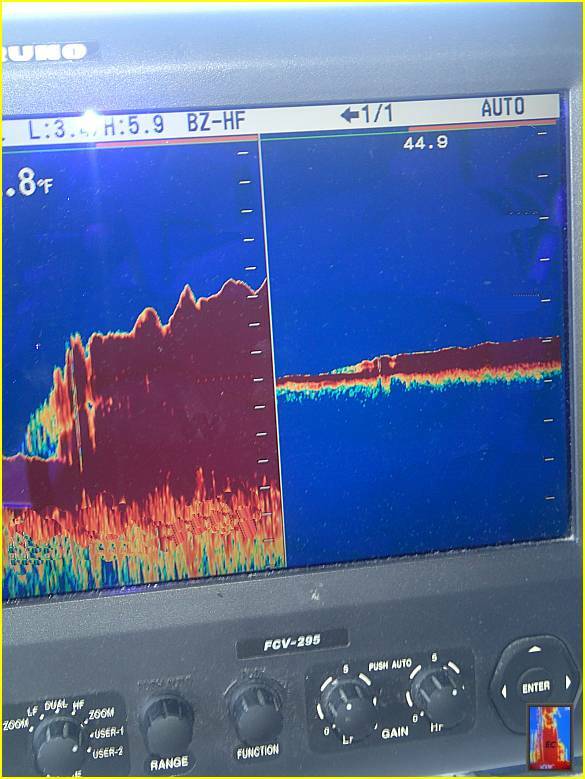 Interestingly enough, a slow mix of ling and sea flounders came up over this leveled out wreck. It was a sticky bugger, but not as bad as some of the wrecks that we would encounter later in the trip. 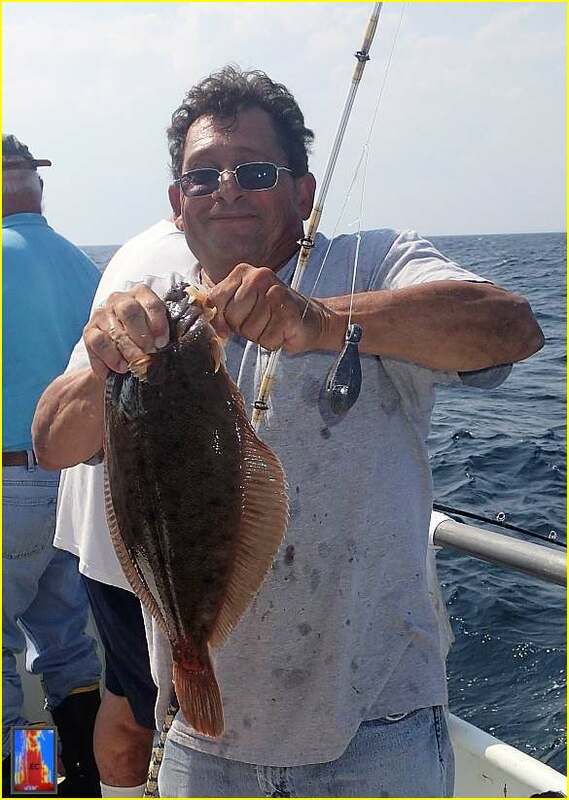 In the stern where our group was fishing made up of Richie M. along with his buddy and another VOYAGER regular Phil, and his daughter Giovanna, caught their first big sea flounder. 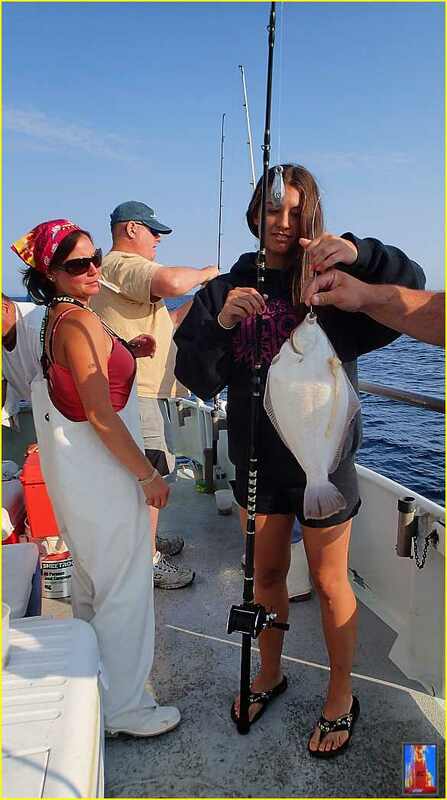 Notice Maria looking at a fish, more then the equal to a legal summer flounder in size! 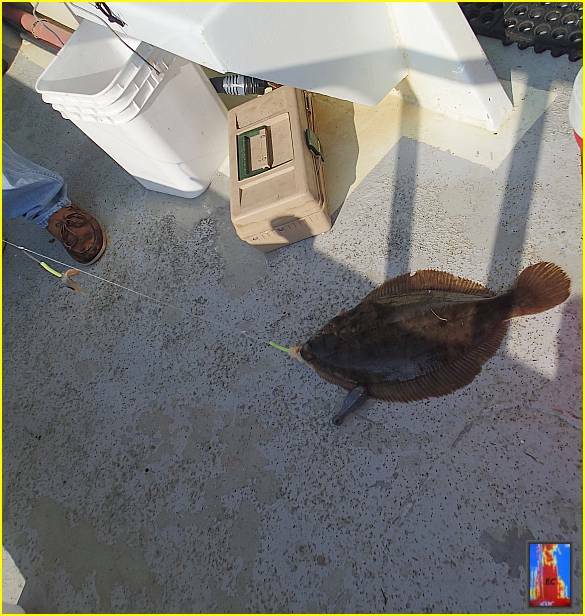 Here is a quickie pic of the sea flounder bottom rig I was using, one tied on a 54" length of OE TACKLE - hank leader material in pound tests ranging from 40 to 50 and even 60 lb test. I found that other then the heavy leader holding up slightly better to abrasion, using any of the above listed pound test leader material will work as well as the next. Now here in this image, notice the single hook rig to the left, which is full length as compared to the rig to the right, which is shortened due to me breaking it out after getting hung up in a wreck. I was able to get my rig back sans the sinker. I then proceeded to quickly re-tie the rig and add another sinker. On this trip using this rig, I never lost one hook, only one sinker as I was always able to pull and recover the rig if stuck in the wreck out. If the hook was bent, and here I was using a 2/0 size forged OE TACKLE - Bait Holder hook, which if out of shape, was bent back into shape if the tip of the hook was not damaged. Also when you tie your rig, there is a number of ways to make the connection of a snelled hook to the mainline. Here you can choose the standoff knot, 'Pete K' - over hand knot (has a braided look to it as you make overhand knots by passing the hook from one side, then the other up the length of the dropper loop of the snelled hook), or tied off with a few over hand cinch knots. The standoff knot if properly tied, is a bear to normally break off and you tend to pop off the rig where your mono top shot connects to a 175 or 225 lb swivel. Here we typically tie the Berkley style knot or Double Clinch knot for that connection.Go here and pick one of these connections. They are pretty strong and will ensure that something below this knot will break first. The primary reason why we use this rig is since it greatly lessens the loss of tackle as you are able to pull the rig out from the obstruction. 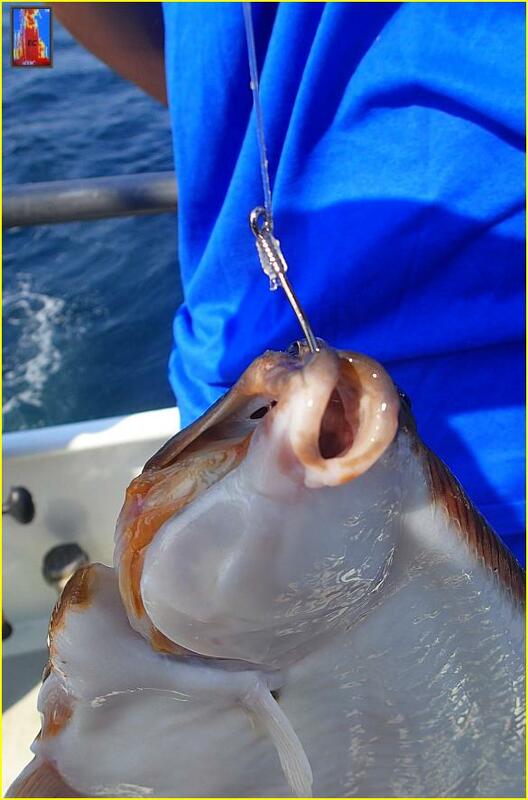 Even with the single hook, I doubt there is much of a difference in the catch rate of fish during a trip. 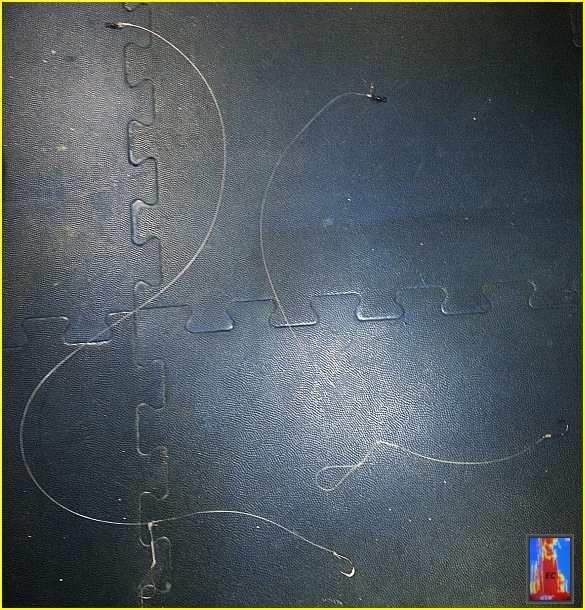 Yes, some may feel that this does eliminate the chance of catching a double header or having at least one hook on the bottom with bait when the other hook is cleaned off, but that has to be balanced against rig losses along with these time consuming messes that commonly occur and have to be unraveled during the trip. 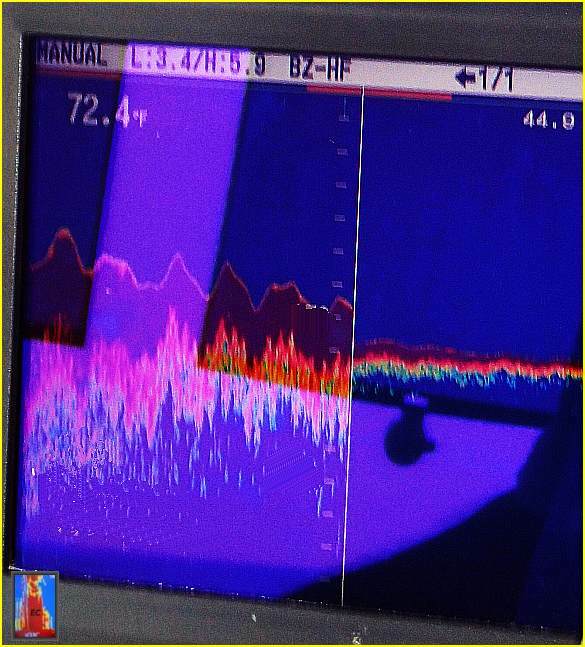 Though I may give the illusion here that we were beating the pants off the fish, in most cases the fishing is generally a blast a fish when the boat squares up on the wreck, then settles into a pick down to a grind especially if the ling don't come up as fast as they should. Stay at the rail and keep working your rig on the bottom (tea-bag technique here), and re-bait with fresh bait when necessary. Once again, the more time in the water, increases the odds of you catching fish. 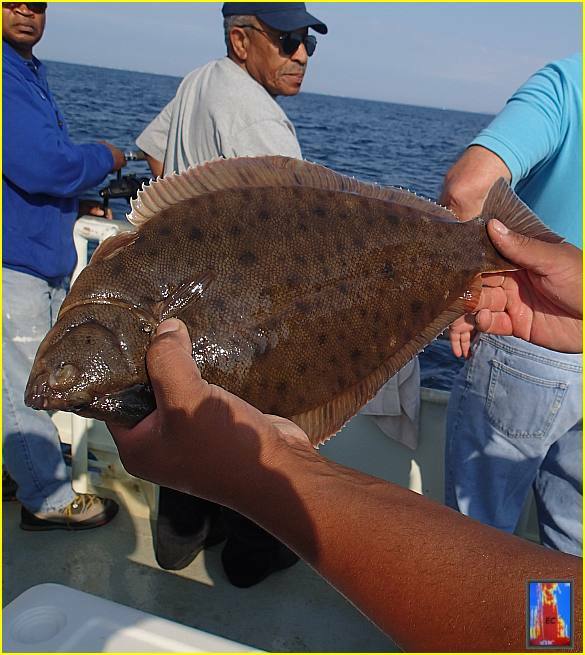 In the image below, here a sea flounder is caught on the popularly used HI-Lo rig, one that should be used when fishing on the Ling-Sea Bass trips. 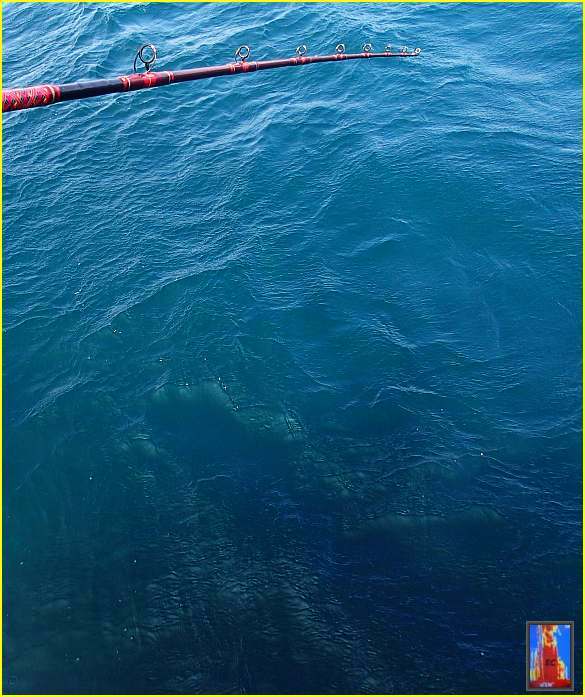 After a few shifts around the first wreck of the day, it was onto the second wreck, one in where the single hook rig lessens the repeatedly loss of terminal tackle rigs. Now a slow pass over one side. 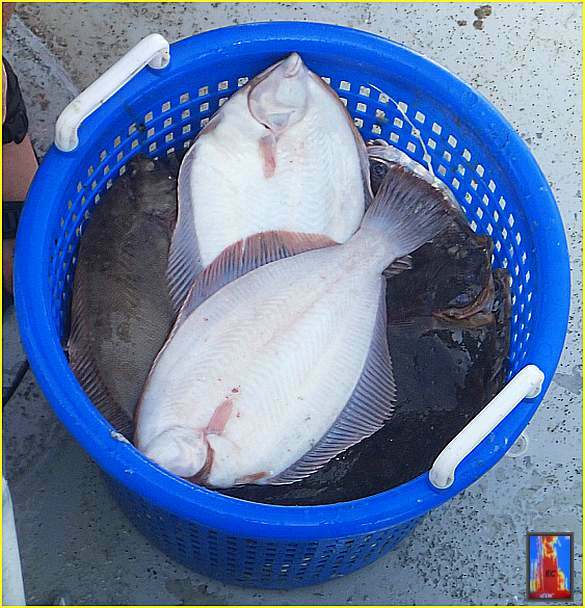 Here another shot of quality sea flounders which came up as Captain Jeff and Maria worked their way around the deck. 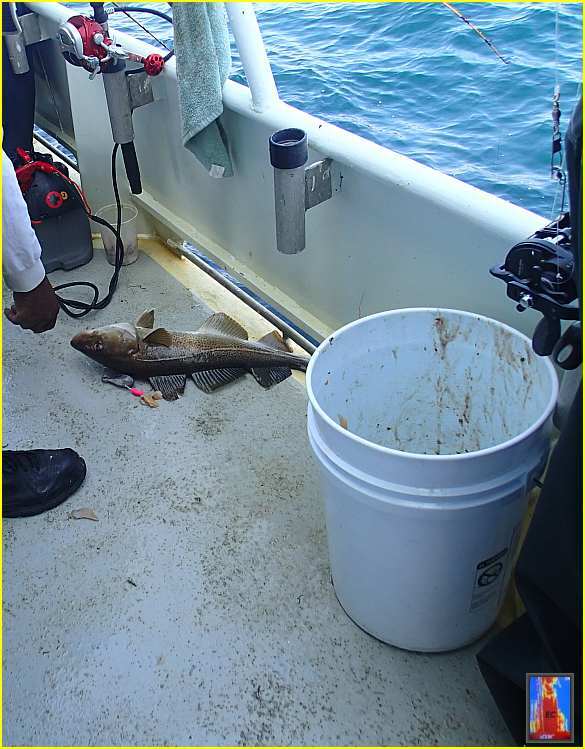 The second, is one which normally will take the pool on these trips unless a larger pollock is landed. This is where some will say "use the Hi-Lo" since you do not want to miss out on catching cod and pollock on these trips and taking the pool. 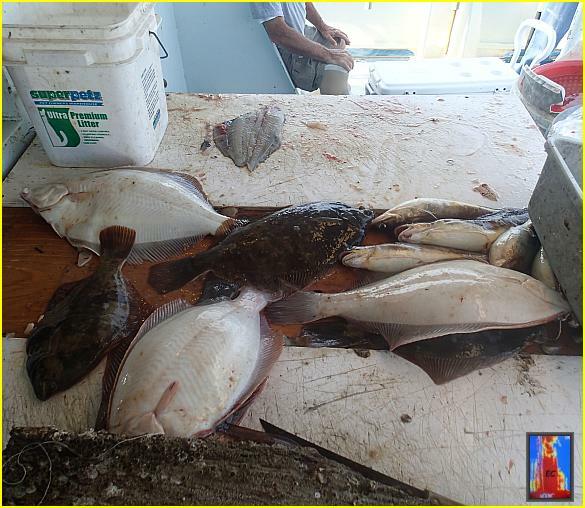 During this time, sea flounders were being caught and I took a few more pics of the fish caught in or near the stern of the VOYAGER. 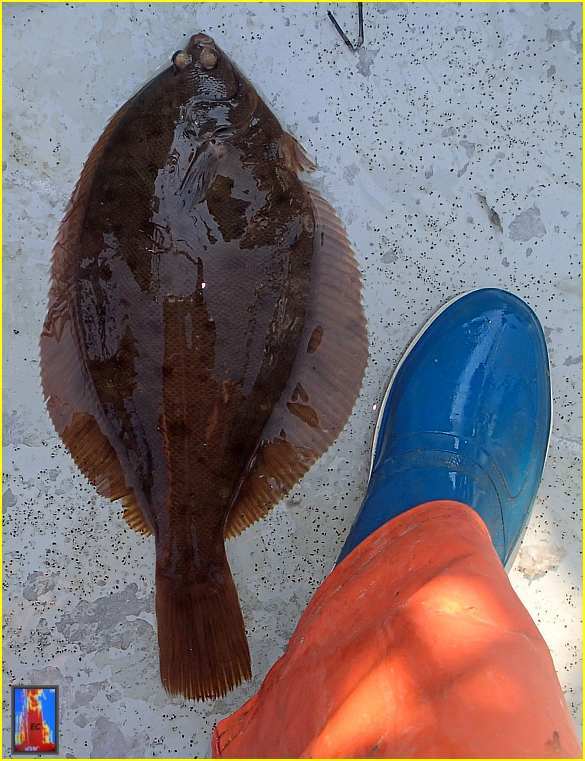 One of the things you will notice is the brick like colored, off-reddish-tinge on some of these sea flounders. As the fishing slowed to a bare pick, it was off again to another wreck. During the time when the VOYAGER is making a move to another spot, assess how the rig you have on is working....or not working. Make the change on your rod if necessary, and have a rig or two at the ready, then recharge your groups bait pail if you have to. 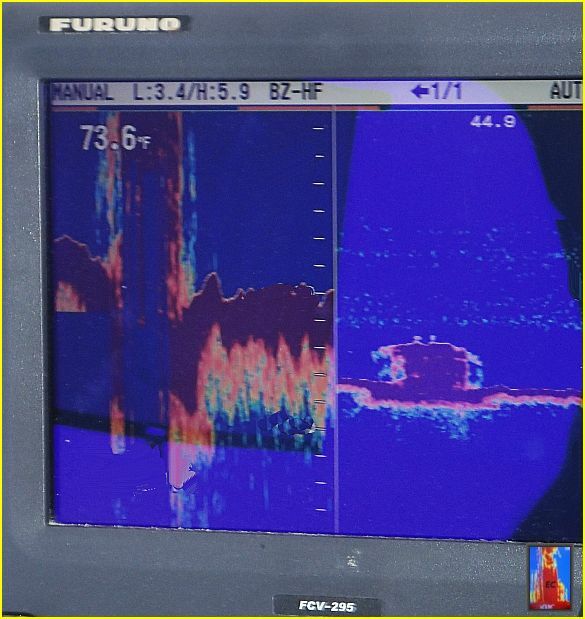 For those interested what they are fishing, here is how a barge looks on the color machine...and we definitely know this is a barge, and not just by its box-like shape when you pass over it either. 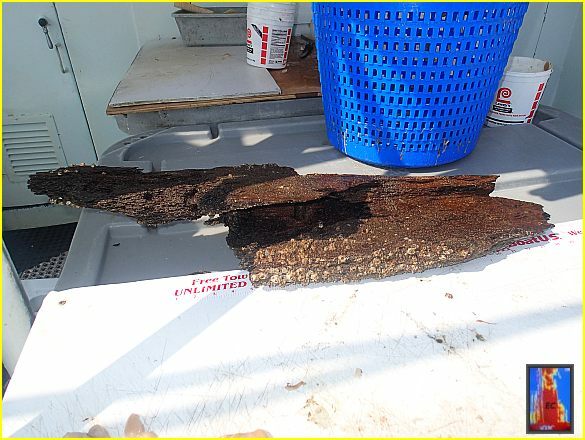 By this time of the trip, I was just taking pictures of any of the bigger sea flounder, and over the course on fishing the next two wrecks, the fishing was slower then it should be. 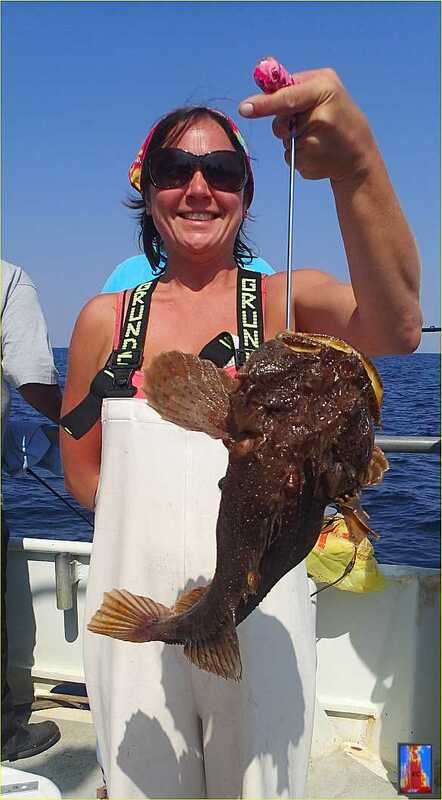 This happens and is to be expected on these trips especially as the ling and flounders move off into the depths during the summer. Finally someone getting the 'hang' of it. 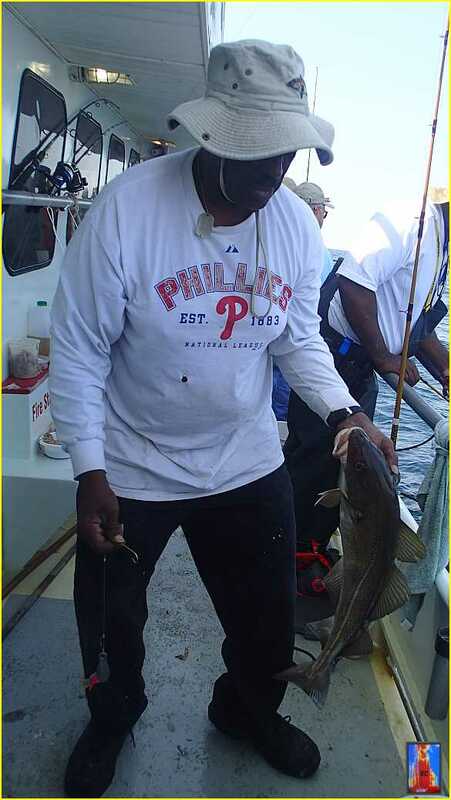 Big Nicholas with a quality keeper fish. 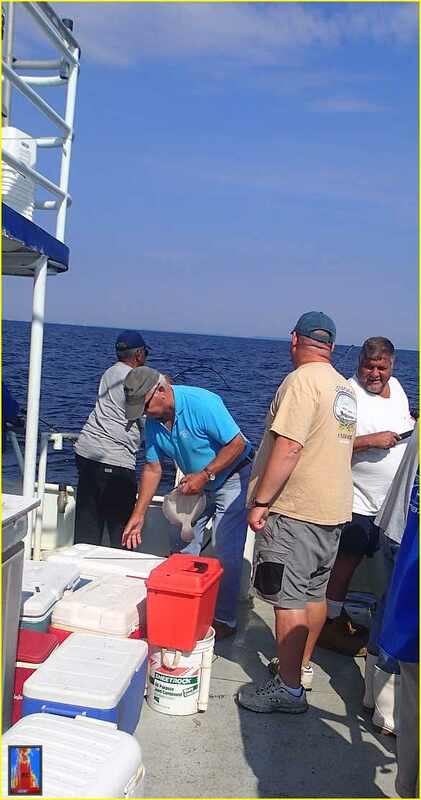 We culled fished throughout the day, setting our 'minimum cooler size keeper' at 15 inches (New Jersey sets a minimum size limit of 12 inches). 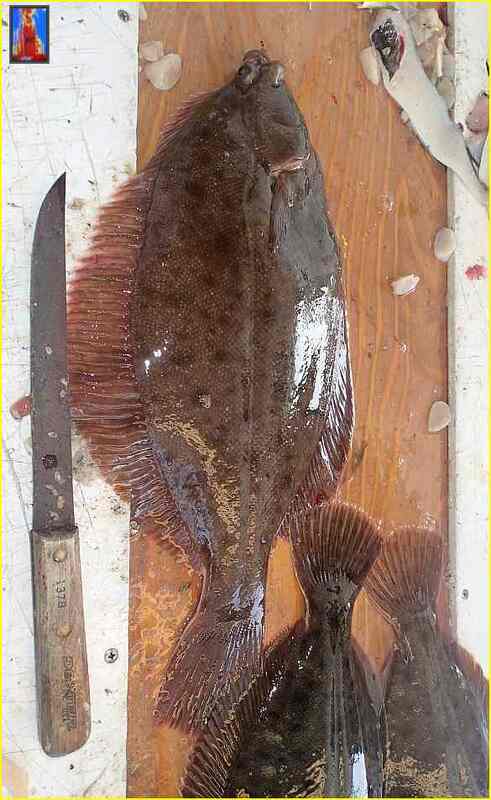 Compared to a fluke of a similar size, a 15 inch blackback flounder is slightly thicker when filleted. 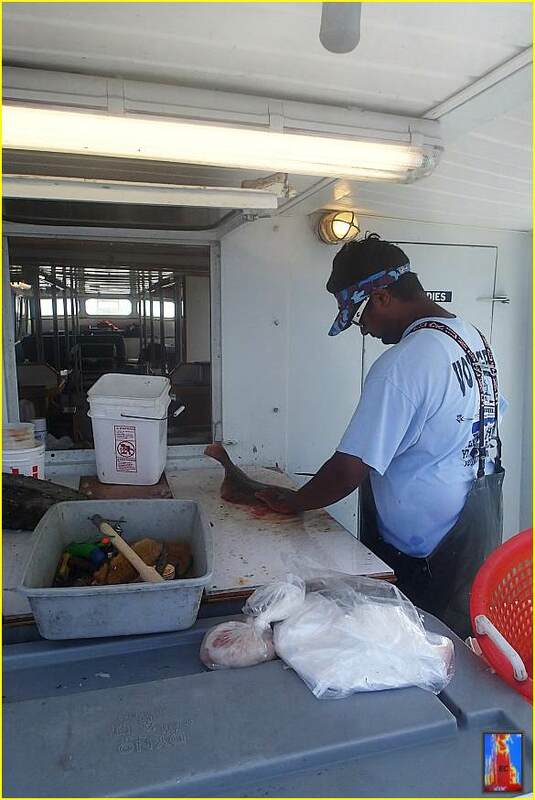 Here mate Kevin starts to get to work cutting fish. The day was moving along and before we knew it, it was just after 1400 hrs. It was onto the last wreck of the day, one which looks like it would go through the bottom of the VOYAGER. 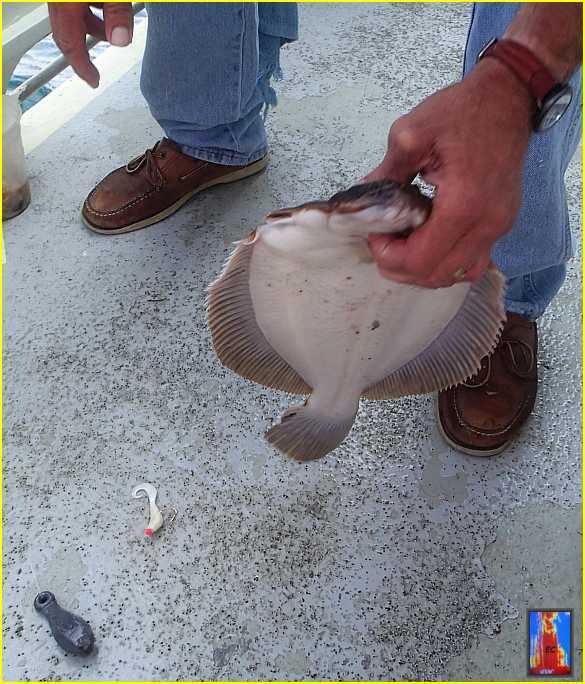 In a case where one would think, "saving the best spot for last", we did have a very decent sea flounder bite going along with a big surprise on this last drop. Nicholas did catch one which I laid next to my fashionable fishing boot. Yes that one make a nice one to stuff with crabmeat! As the wind had picked up out of the southwest that afternoon, we spotted a blue colored floating lobster box coming towards the VOYAGER. We had also noticed the tails of what appeared to be some large sharks along with some colorfully flashes off in the distance. Between fish coming up, the floating lobster box came closer and with that, we saw what was circling around it....some large mahi...not one or two, but a few. Richie M. grabbed a handful of skimmers and tossed them in the water near the VOYAGER and said to reel up, remove your sinker and cast out with a piece of skimmer on the hook. His buddy did as instructed, and it was game on at the rail. I was only able to snap these shots of the mahi coming within a little more of a rods distance from the VOYAGER, before we had a hard charging mahi inhale, then peel off line from Phil's reel. 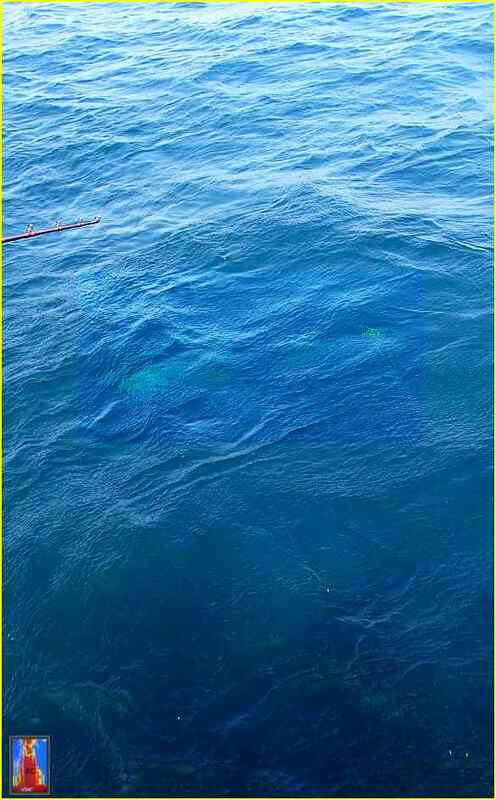 In this image, where you see some white specs along the water, you can barely make out by our count 4 mahi's passing this close to the VOYAGER. THe big mahi took him for a ride up the starboard side of the VOYAGER before jumping as Phil maneuvered between fishermen who did not back off from the rail. At this time of the year, and already more then a few times this season, a number of mahi from chicken to fish into the 20 lb class have been landed. For those who have a heavy duty spnning outfit setup at the ready, keep this in mind. After that excitement it was long past time to go home. Captain Jeff had put in a extra long day. I just took a few pics of what people were bringing up to Kevin to be cut. 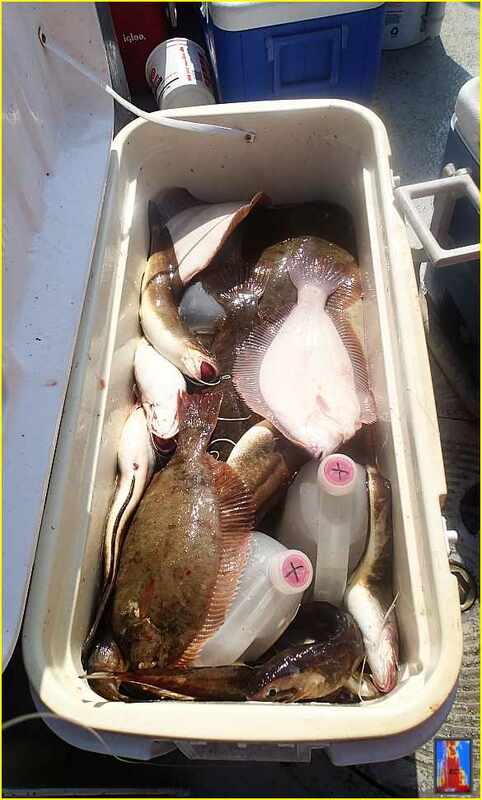 Some fishermen and their group had a very decent day from the looks of it. Since this was written for an online forum, I just want to sum this up with a few bullet points with the VOYAGER steaming back in. - One hook bottom rigs tied with heavy leader material and using either a 2/0 bait holder, 2/0 or 3/0 wide gap hook or kirks and a old time favorite, the #6 - 4011E Mustad brand 'Virginia' hook due to the makeup and strength of the hook, are your better choices here. - The Octupus style will also be a popular choice for this fishing, but from what we have seen, we primarily will choose the hook styles form the first group listed here. - If you feel the risk of losing a rig, two or three is worth the cost, then add either a high hook, and/or use a tandem rig (that's two hooks tied together) next to your sinker. But I will add that they are a very popular choice, and the ling seem to love them. In fact, from the trip the day before, a scuplin seemed to enjoy sucking on these things.... from what I was told, they were not put there by some angler looking for a Kodak moment shot. It's your choice here, but I doubt they are necessary, but I will add that Chris 'Crabcake' did mention using the bloodworm instead of the sandworm in this case....more experimenting with verification needed here! 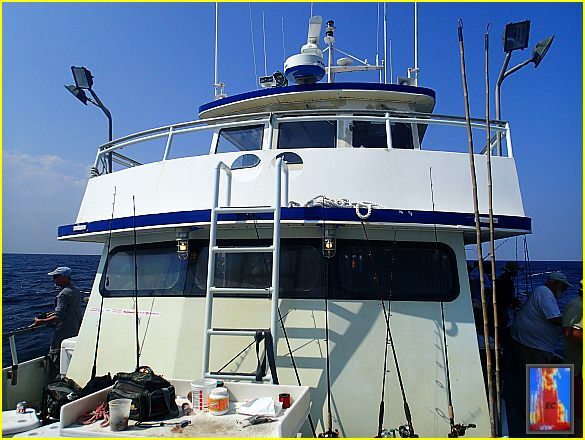 - There will be groups of fishermen that come down to fish on the VOYAGER for this type of fishing, so don't worry about possibly getting squeezed out of your favorite fishing section of the boat. 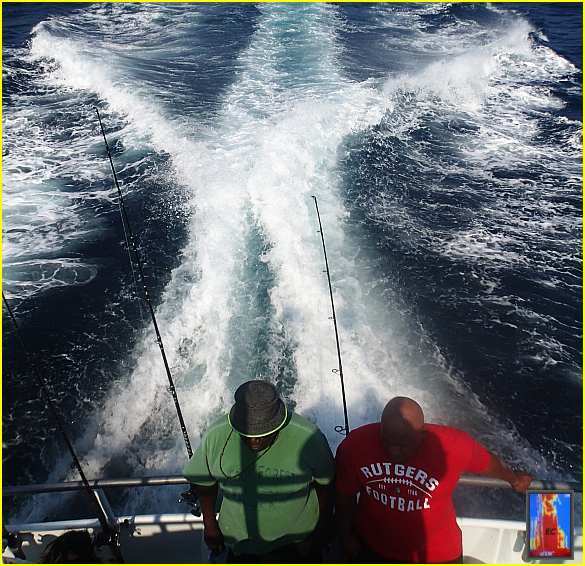 I have not only seen, but have heard that depending on the day, the bow can be much better then the stern or the biggest fish of the trip being caught along the port or starboard side of the boat. 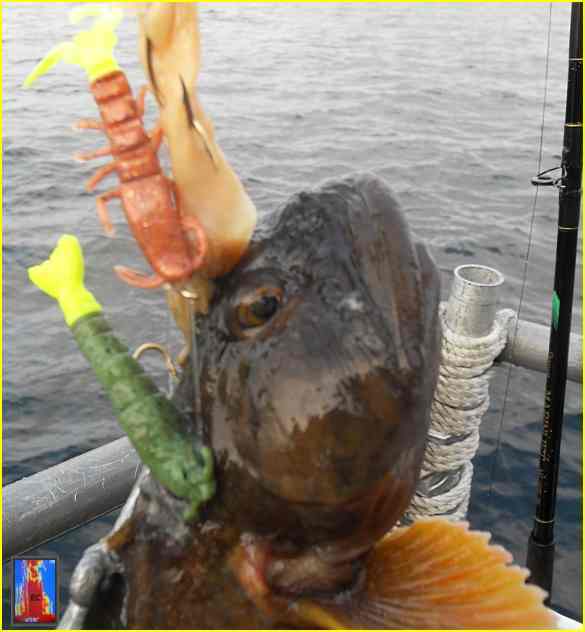 In fact, there is no 'primo' area on the boat to fish...it is up to you on how YOU rig up and fish. - Electrical reels are seen on these trips and are not out of place. On this trip, I saw three different electric reels being used, by groups that came down...one in fact who drives up from the Eastern Shore to fish on the VOYAGER. 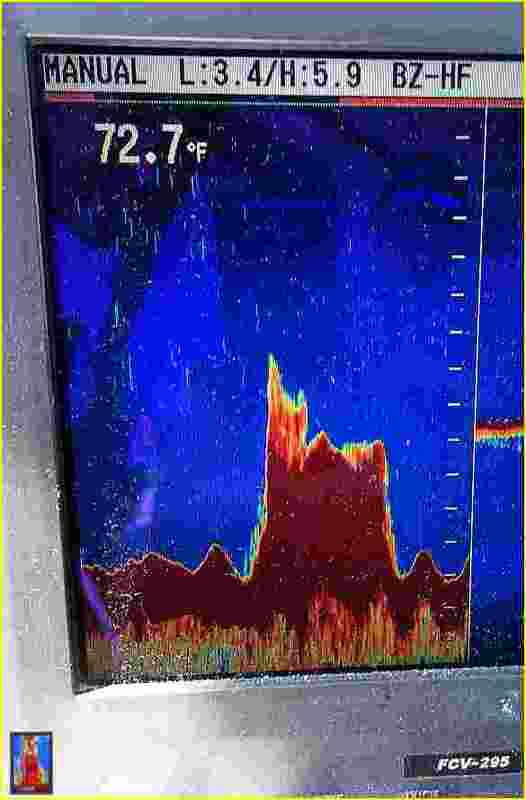 For those who don't enjoy cranking in the depths that may be fished on these trips, up to 40 fathoms, an electrical reel instead of a hand-crank may work for you...but is not necessary. 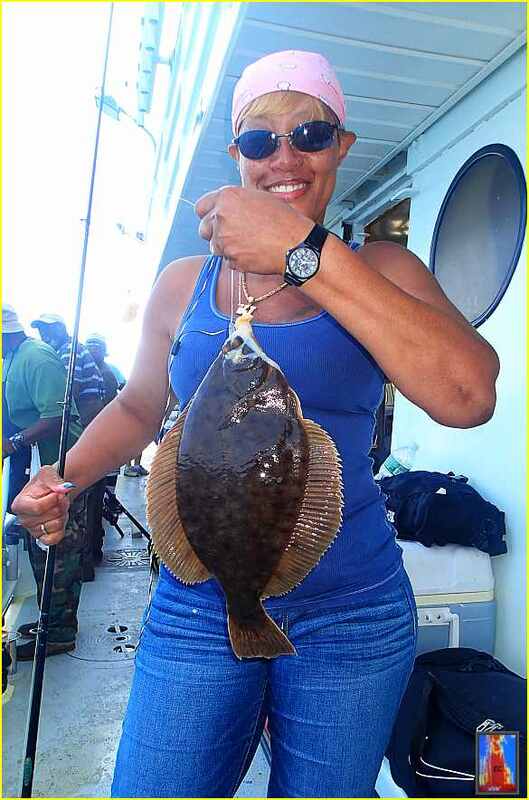 - Fresh and lightly salted skimmer bait is the ticket, and I would not worry about a bait situation arising on needing something special to target these sea flounder. 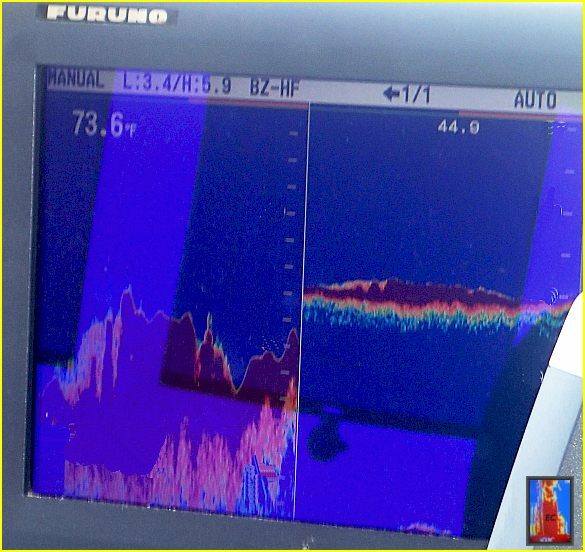 They are literally anywhere you go in the depths, and though I have seen on the last BROOKLYN VI offshore wreck trips live sandworms doing a job on the big flatties, there is no need to pickup a few dozen sand or blood worms for fishing on the Ling Marathons, or for that matter, Ling & Sea Bass trips. You may see me along some of these trips during the rest of the season. They are a blast and a perfect trip to introduce young people to wreck and bottom fishing. 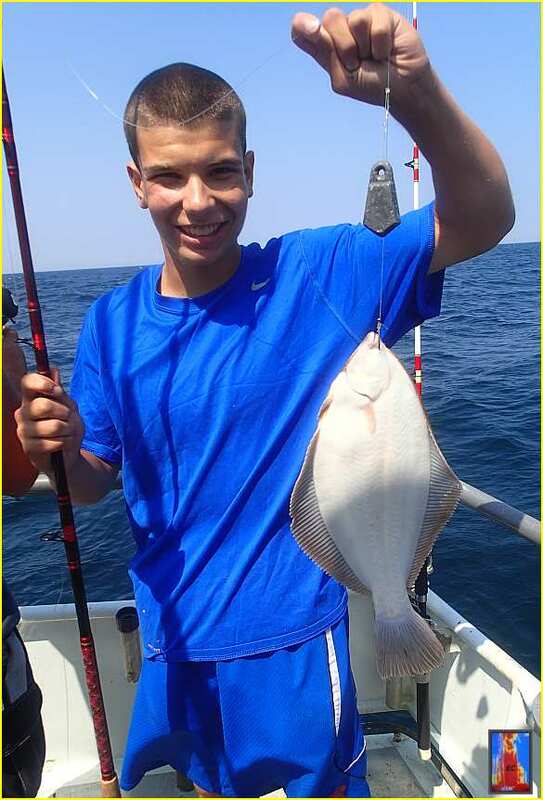 My son is a newbie to this type of fishing, and he personally caught a limit-plus. 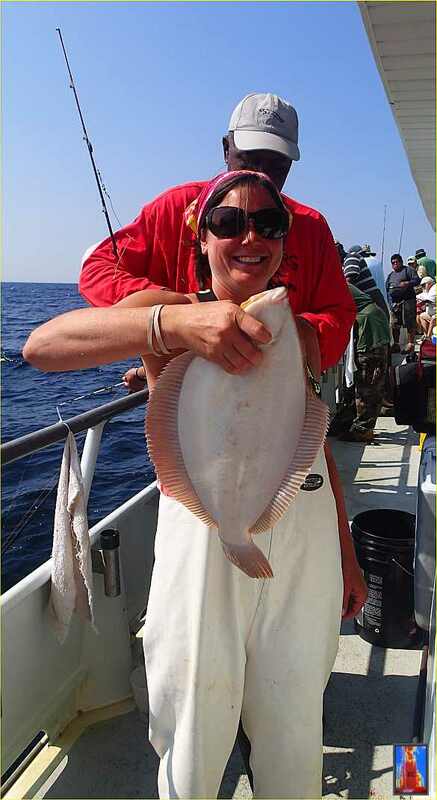 Here again I mention that you can set a higher size limit to bring home your two biggest flatfish of the trip. 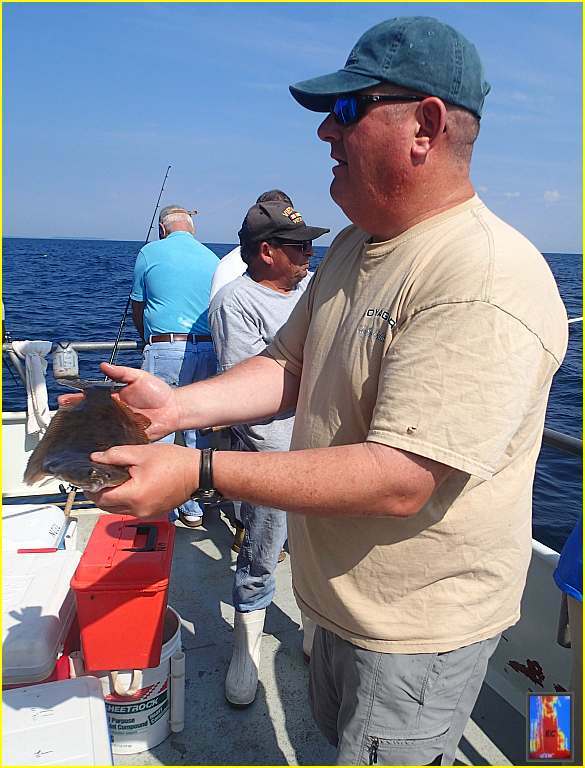 If it looks like a measurable size blackback flounder (yes legal size) you catch in the morning, you can get away by discarding it back. 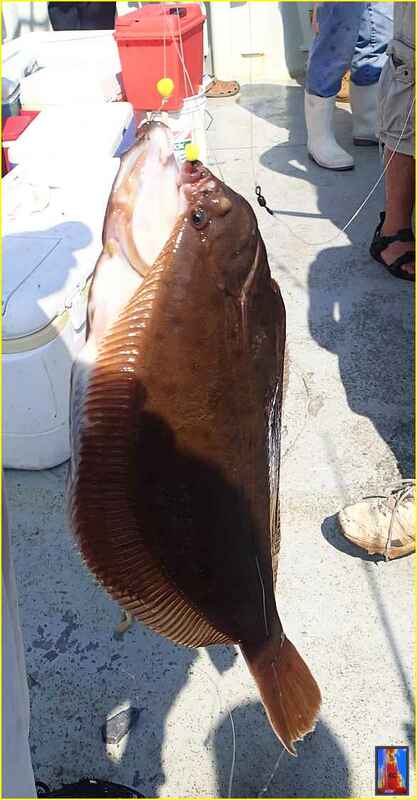 Odds are that you will catch a much bigger sea flounder or two during the trip. 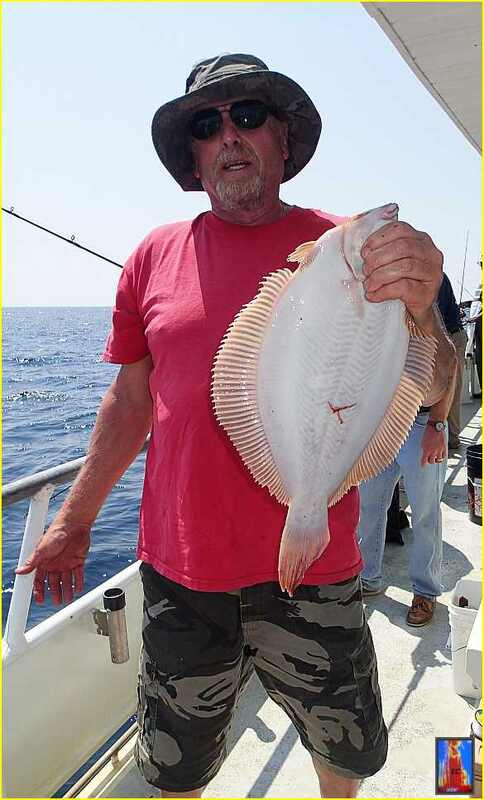 I do hope I made you more aware of the opportunities here to make a catch of these sea flounders during the deep water bottom trips. it truly is one of the best party boat day trips you can take during the summer. Those sea ravens are very good eating. Like little monkfish in texture and flavor. Just seen this - great story and photos. Seeing those flounder pics sure got my attention and jogged so many old memories. Thanks again - love those flatties !